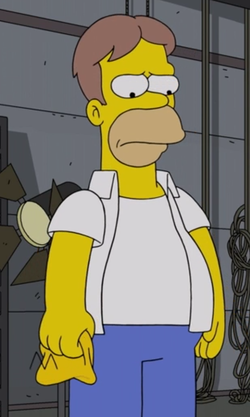 The actor playing Homer is an actor who played Homer Simpson in the film Bart's Not Dead. Homer and Bart watched a live recording of the film where the Actor playing Bart told Homer's actor that Jesus said to tell him that things would get better. Shortly after, Bart went to grab Homer's hand and told him that he was feeling weird, only to realize that it was the actor playing Homer instead. The actor then told Bart that he was not his father, then removed the bald cap and undid his shirt, letting a load of padding fall out. Bart then questioned about him needing all that padding and the actor told Bart that he was fat to begin with. In the film, the actor playing Homer walked down the corridor in the hospital with his family.